The wedding was beautiful. The brides were gorgeous and the grooms were handsome. The webcast enabled 400-500 people to watch the wedding over the internet -- from California, Oregon, Washington, Idaho, Nevada, Texas, Michigan, Illinois, South Carolina, North Carolina, Georgia, Massachussetts, Minnesota, Ohio, Colorado, Pennsylvania, and many other states, as well as Taiwan and England! We're delighted and grateful that so many of you were able to attend the wedding over the internet. 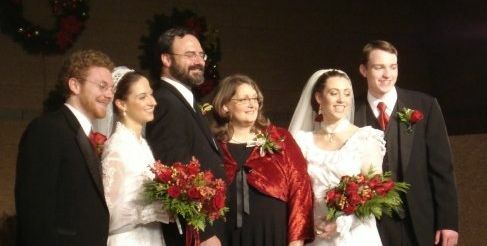 Between the live congregation and the webcast audience well over 750 people attended the Double Wedding. Thank you to the young men who put together the webcast in just a few hours: Scott Hieronymous and Benjamin Nieuwsma, with the incredible tech support of Nathan Anderson (who interrupted his duties as a groomsman to help trouble-shoot the webcast before the wedding started).